In the past few years, Indian food in New York has seen something of a renaissance, brought on by chefs unafraid to push past generic curries and offer menus that are specific, regional, and experimental. 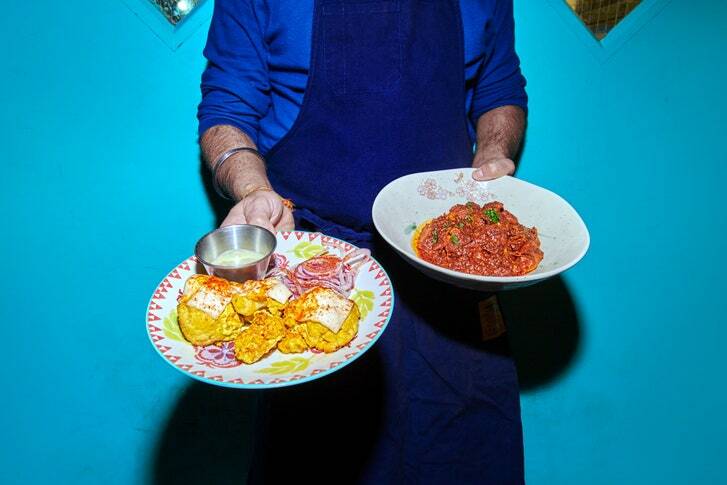 But whenever Chintan Pandya, the chef at Rahi, which opened in the West Village last year, was asked where he liked to eat Indian food on his own time, he found himself without a good answer. The places that passed muster were too expensive. The places that were affordable didn’t pass muster. Eventually, he realized that he could solve this problem. In September, he and his partner at Rahi, Roni Mazumdar, opened Adda, a “canteen” that serves the kind of unpretentious, homey food that “Indian people actually eat,” Mazumdar said, as he and Pandya made rounds in the dining room one recent afternoon. To insure quality, they kept the menu small. “We can’t do justice to forty pages,” Mazumdar said. To keep prices down, they chose a low-rent location in Long Island City. Otherwise, they did exactly as they pleased, plastering the walls with colorful Indian newsprint and choosing an eclectic array of their favorite multiregional specialties. 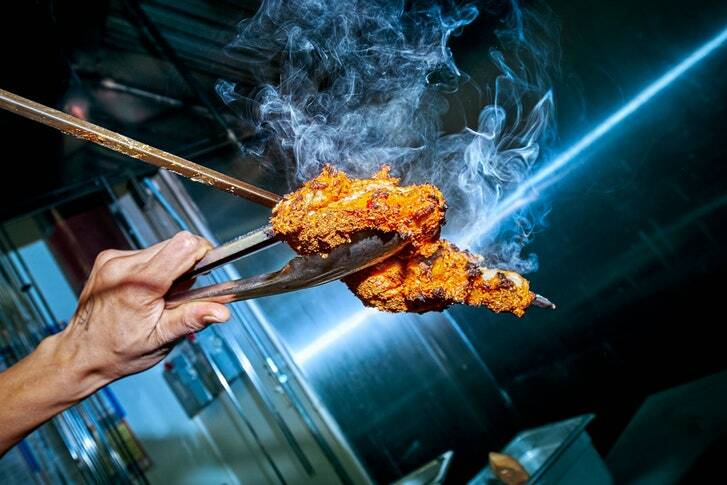 For a dish called bhatti da murgh, a chicken leg is thickly coated with spices and cooked on an iron spit in the tandoor. Some of these are hard to find elsewhere in the city, or even in the U.S., like bheja fry, a dish commonly eaten in Parsi and Muslim communities. If no one told you, you’d never know that the main ingredient was goat brain, which looks, enveloped in a ruddy reduction of ginger, onions, and chili, like any other ground meat, with a slightly curdier, airier texture and an earthy, mineral tang. In Mumbai, Pandya’s home town, it’s commonly eaten on the go; here it’s billed as a “snack,” along with other street foods, including a fantastic aloo chana chaat, made with smashed fingerling potatoes and chickpeas blanketed in luscious yogurt and sweet and spicy chutneys. 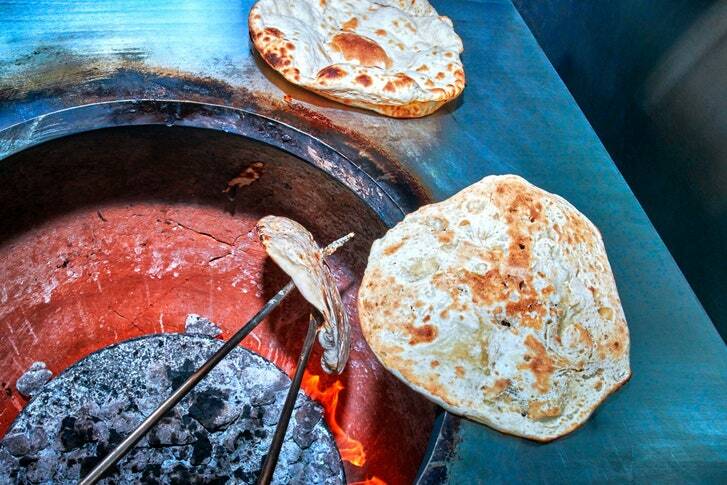 Naan—finished with butter, garlic, or amul cheese and fresh chilis—is also cooked in the tandoor. 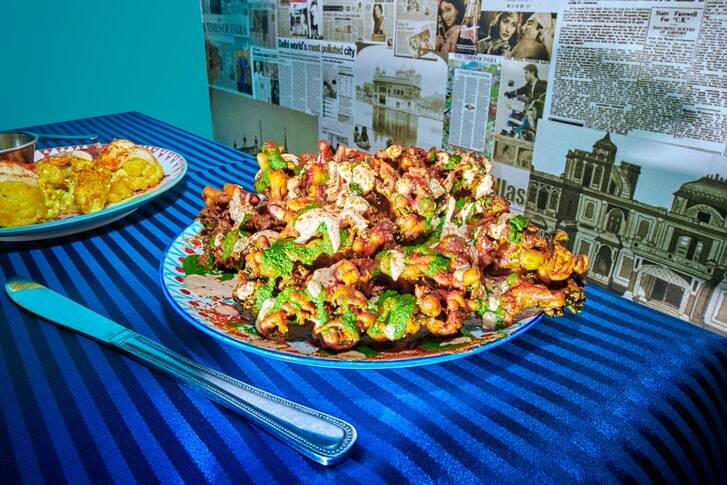 From left: tandoori gobi, or cauliflower, with melted amul cheese, garlic, ginger, and chili powder; masaledar lipatwan murgh, a chicken dish inspired by food stalls in Delhi. A pile of pakoda, or traditional Indian fritters, made here with kale coated in chickpea flour, which is fried and finished with masala powder and chutneys. Has Toxic Algae Returned to Lake Okeechobee?